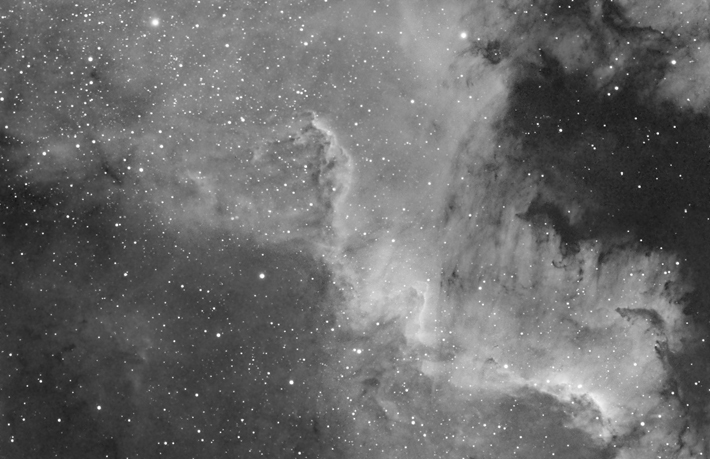 This is a four frame mosaic of the Southern portion of the North America Nebula (NGC7000) taken in the Hydrogen Alpha spectrum. I suppose you could call this the "Mexico Nebula". Each frame was 2.5 hours of exposure using 15 minute sub frames for a total of 10 hours exposure time. Note: This image received 1st Place for the category "Deep Space - Nebula" at the 2004 MidAtlantic Star Party Astrophotography contest.